Antioxidants are reducing agents that limit free radical activity and limit the damage reactive oxygen species can do. Glutathione or GSH is referred to as the body’s “master antioxidant” or the “mother of all antioxidants” because it is your body’s primary and most prevalent protector, found in all mammalian tissue. GSH is a key determinant of redox signaling, regulated cell proliferation, apoptosis, immune function, free radical scavenging, detoxification of xenobiotics, fibrogenesis and regulates cell proliferation. Short list of conditions associated with low GSH levels. Glutathione molecules are tripeptides consisting of glutamine, cysteine and glycine. 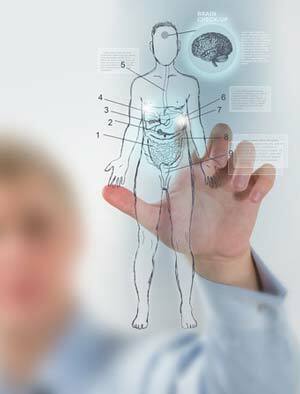 Created and recycled within the body, when it has the right tools, and found throughout every cell. Deficiency in glutathione has been discovered and linked to a myriad of chronic, inflammatory, and degenerative diseases. 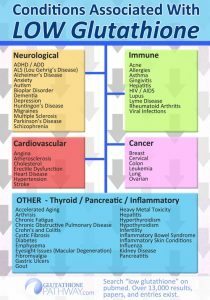 This info-graphic organizes just some of the conditions associated with low glutathione levels. Because production of Glutathione slows as you age, and working with the free-radical theory of aging and fitting other theories as well, there is research being done on the link between GSH and aging itself. So glutathione could have anti-aging benefits beyond simply being linked to mitigating the degenerative illnesses that come with age. 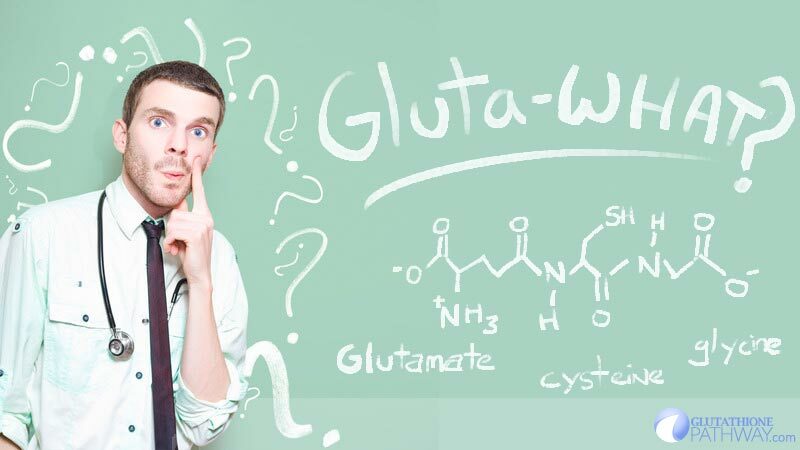 Why is Glutathione a better antioxidant? One of the key reasons, is it’s intracellular. It is the first line of defense against the reactive oxygen species created by the oxygen consumed in the cellular mitochondria. It’s uniquely able to promote other antioxidant activity. It’s true that your body produces and recycles it’s own supply of glutathione. Unfortunately this synthesis only occurs if you have the correct pre-cursors and ingredients to do so. 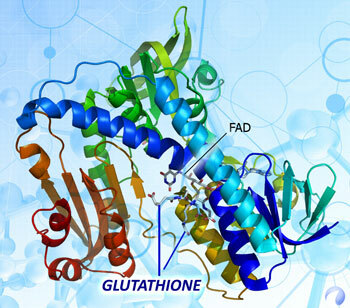 The process of glutathione synthesis is highly regulated by two major enzymatic steps which both disease and environmental factors can disrupt. A tripeptide of glutamine, cysteine and glycine, the most common limiting factor in producing glutathione is the semi-essential amino acid Cysteine. The glutamine and glycine are generally not lacking in a typical Western diet. Two ATP requiring enzymatic steps synthesize GSH from amino acids. Glycine is added to the C-terminal of gamma-glutamylcysteine via the enzyme glutathione synthetase. Even though glutathione is synthesized from precursor amino acids in virtually every cell, the liver has your highest concentration because it’s hepatocyte cells have unique GSH synthesis abilities. The ability to convert methionine to cysteine through the transsulfuration pathway, and the regulation of GSH biosynthesis based on rate of export into plasma, bile, and mitochondria. Short answer, the liver is responsible for mitochondrial glutathione. Your liver health and GSH production has been shown to be critical to life itself. In a study of mice with genetically unable to synthesize GSH in hepatic cells suffered steatosis (or fatty liver) with mitochondrial injury and liver failure to the point of death within a month of birth. If you search for glutathione supplements you’ll often find reduced glutathione. As a free radical scavenger glutathione needs to be in a reduced state, which means it lacks an oxygen molecule and has an extra electron to donate to a highly reactive or “free radical”. Giving up an electron means the glutathione molecule itself becomes reactive, but instead of causing damage stealing electrons from other cells it readily binds to other reactive gsh molecules to create glutathione disulfide or GSSG. Going through yet another process the GSSG can be restored to GSH by an enzyme known as glutathione reductase. So as long as your reductase processes are working properly your body will continue to recycle gssg to produce reduced glutathione molecules that continue to ‘turn off’ damaging free radicals. This inherent recycling of glutathione means the true measure of healthy glutathione production and maintenance is actually the ratio of GSSG and GSH within your body. In a healthy person with healthy tissue cells, up to 98% of glutathione should be reduced as GSH and less than 2% GSSG. A higher GSSG number means your body is under a heavy load of oxidative stress, using up it’s stores of GSH that would usually be more abundant. We’ve already expressed just how critical Glutathione is to your health, and acting as your first anti-oxidant line of defense within every cell in your body. The benefits of glutathione cascade out from it’s cellular health benefits and studies continue on. Anti Aging – The free radical theory suggests reactive oxygen species can build up over time causing damage and breaking down your ability to resist and recover from degenerative conditions. Your body produces less glutathione as it ages, and low glutathione levels are correlated with nearly all age related illnesses. There is a strong case for Glutathione being a major player in protecting and ameliorating age related illness. Antiviral Activity – Glutathione is your first line of defense. When your body is infected with a virus it can replicate and take hold quickly, while depleting GSH levels. There’s evidence to suggest (at least in the case of HSV-1) that adding GSH will not only help restore levels, but inhibits replication of the virus. Anyone struggling with a viral infection may find glutathione assisting in restoring their immune function and lowering the viral load stressing the body. Brain and Cognitive Function – Your brain uses a lot of oxygen, and as such creates a lot of oxidative stress. Maintaining glutathione levels in the brain is crucial as low glutathione levels shows a closed link to learning and synaptic plasticity deficits. Low glutathione levels are found in autism, dementia, parkinson’s, schizophrenia, and alzheimer’s patients as well. DNA – Your blood itself responsible for transporting oxygen and nutrients throughout your body and carrying your genetic code, is protected by GSH. Glutathione has been shown to protect against DNA strand breakage by KBrO(3). DNA damage can lead to DNA mutation, mutated cells then replicate and can cause other issues. If Glutathione can repair damaged DNA and limit mutation factors, as studies are beginning to show, Glutathione could be crucial to healthy DNA. Heavy Metal Chelator – Buildup of heavy metals in the body can be a slow process from any number of pollutants you are unknowingly exposed to. You may even experience ‘unexplained’ symptoms because the build up is so slow. Glutathione plays a key role as a potent chelator, cellular responder, transporter, and excretion of heavy metals. GSH levels are a biomarker for toxic metal overload… if you have too many metals, your glutathione levels will be low. Immune System Health – Your immune system is an elaborate coalition of cells from different parts of the body that protect you from invading bacteria, viruses, pollutants, toxins, and infection. Once again GSH molecules are your body’s primary defense, and enhances the function of T cells that are your body’s way of killing bad cells. GSH will actually promote the survival of activated T cells. Liver Health and Protection – Your liver is a crucial organ that regulates over 500 enzymatic reactions throughout your body. That’s beyond it’s more obvious role in clearing toxins, and environmental intruders and chemicals like alcohol from your body. Glutathione acting as an anti-inflammatory, cellular protector, anti-oxidant, and heavy metal chelator is truly your body’s ultimate system of health defense. It’s depletion is linked to countless diseases, conditions, and exposure to harmful stress factors like toxins, viruses and pollution. The list above is only the beginning. It is meant as a taste of the benefits of glutathione for your health. Glutathione research is ongoing and there is always more great information coming out. Expect this article to receive updates with more great information!